According to the Wikipedia moose page: The Alaska moose (Alces alces gigas) or giant moose or Alaskan moose is a subspecies of moose that ranges from Alaska to western Yukon. The Alaska moose is one of the largest subspecies of moose. Alaska moose inhabit boreal forests and mixed deciduous forests throughout most of Alaska and most of Western Yukon. Moose are long-legged and heavy bodied with a drooping nose, a “bell” or dewlap under the chin, and a small tail. Their color ranges from golden brown to almost black, depending upon the season and the age of the animal. The hair of newborn calves is generally red-brown fading to a lighter rust color within a few weeks. Newborn calves weigh 28 to 35 pounds and within five months grow to over 300 pounds. Males in prime condition weigh from 1,200 to 1,600 pounds. Adult females weigh 800 to 1,300 pounds. Only the bulls have antlers. The largest moose antlers in North America come from Alaska, the Yukon Territory, and the Northwest Territories of Canada. Trophy class bulls are found throughout Alaska, but the largest come from the western portion of the state. Moose occasionally produce trophy-size antlers when they are 6 or 7 years old, with the largest antlers grown at approximately 10 to 12 years of age. In the wild, moose rarely live more than 16 years. 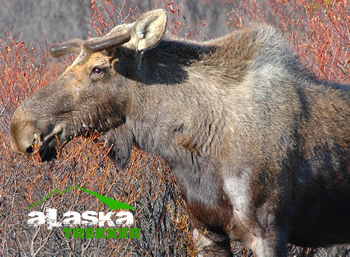 Alaska Moose breed in the fall with the peak of the “rut” activities coming in late September and early October. Adult males joust during the rut by bringing their antlers together and pushing. Serious battles are rare. Bulls may receive a few punctures or other damage and occasionally die from their wounds. The winner usually mates with the female. By late October, adult males have exhausted their summer accumulation of fat and their desire for female company. Once again they begin feeding. Antlers are shed as early as November, but mostly in December and January. 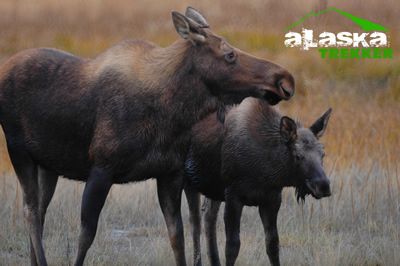 Because Alaska moose range over so much of the state, they have played an important role in the development of the state. At one time professional hunters supplied moose meat to mining camps. Historically, moose were an important source of food, clothing, and implements to Athapaskan Indians dwelling along the major rivers. Today, Alaskans and nonresidents annually harvest approximately 6,000 to 8,000 moose-some 3.5 million pounds of meat. 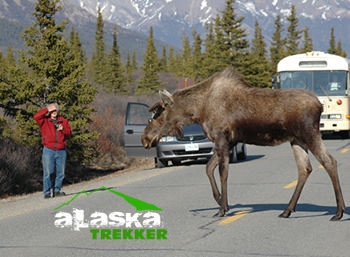 Moose are an important part of the Alaskan landscape, and tourists photograph those animals that feed along the highway. Man’s developments in Alaska include many alterations upon the face of the land. 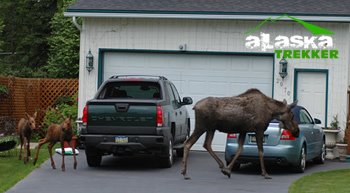 These activities create conflicts between man and moose as moose eat crops, stand on airfields, eat young trees, wander the city streets, and collide with cars and trains. Man’s removal of mature timber through logging and careless use of fire has, in general, benefited moose as new stands of young timber have created vast areas of high-quality moose food. The future for moose is reasonably bright because man is learning how to manipulate habitat with wildfire and is becoming more skilled at managing factors that limit moose populations, such as predation and hunting.